Are you in the market for a new backpack sprayer? You may want to consider what TechLine readers have to say about the make and models they are using. Important Note: We did not ask reviewers to compare different sprayers, but rather to evaluate the sprayer that they use. 147 readers responded to our survey, and 14 different brands of sprayers were cited. The five highest-ranking sprayer brands are discussed below. Stihl brand sprayers received ratings of 4.33 for safety, 4.83 for durability and dependability, 4.00 for ease of repair, 4.33 for harness comfort, and 4.33 for performance. The wand is low quality and expensive to replace. Other weaknesses identified by reviewers include harness comfort, tips, and lid. 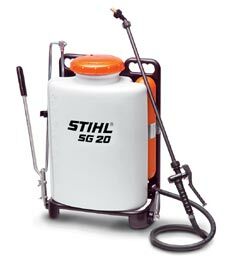 Stihl sprayers have limited availability through dealers. One advantage over many others is that they use an in-tank pump. MANY backpack sprayers have the pump mounted outside and beneath the fluid level, the pump develops a leak in the seal, and before you know it, you have herbicide running down your backside and getting absorbed by the skin. Chapin brand sprayers earned 4.75 for safety, 4.75 for durability and dependability, 3.25 for ease of repair, 4.5 for harness comfort, and 3.75 for performance. Three out of four Chapin reviewers complained about the wands and tips. One reviewer likes the adjustable pressure setting on the Chapin and claims it works quite well for small areas. Jacto sprayers earned ratings of 4.00 for safety, 4.00 for durability and dependability, 3.75 for ease of repair, 3.88 for harness comfort, and 4.25 for performance. Similar to other brands and models, harness comfort is a common complaint with Jacto sprayers. Other weaknesses include tips (need better options for higher gallon needs and longer wand and appropriate tip for basal bark treatments), leaks from the pump cylinder (when bending over), hard to reach strainer, poor pressure retention. Two reviewers mentioned problems with the mount at the top of the pump breaking. Smith brand sprayers received ratings of 4.0 for safety, 3.8 for durability and dependability, 4.0 for ease of repair, 3.8 for harness comfort, and 4.2 for performance. Four of five reviewers of Smith sprayers identified wand and handle as the weakest components. Only one complained of lid leaks. SPS Series sprayers received ratings of 3.93 for safety, 4.13 for durability and dependability, 3.67 for ease of repair, 3.27 for harness comfort, and 4.13 for performance. While one reviewer claims that SP sprayers don’t leak, leaks from the lid gasket, diaphragm, and o-rings seem a common complaint from others. Two reviewers indicated specifically that leaks occur when the applicator is bending over, jostling around, or falling down. SP sprayers have a catch basin to help contain leaks, but it may be necessary to insert a paper towel or sponge to prevent spilling down the back when bent over. Comfort is a common complaint from backpack sprayer users. One reviewer claims that SP sprayers comfort exceeds that of Chapin models. Yet, several suggest a higher quality harnesses and improved ergonomic tank design. Also cited as problems are a stiff or sticky hand wand valve or trigger, unstable “quick attach” harness straps, “tank innards” (specific problem not specified), and difficult-to-read tank level markings. Described as a “good all-around unit”, SP models are said to be durable, be fairly comfortable, and spray well. Other strengths include the brass wand and a handle making it easier to unscrew the tip were cited as pros. 3.16 for safety, 3.6 for durability and dependability, 3.5 for ease of repair, 2.80 for harness comfort, and 3.55 for performance. An overwhelming majority of survey responses reviewed Solo backpack sprayers (67%). Solo is a common brand carried by many suppliers, and replacement parts and other applicators who have experience with this sprayer are very accessible. But, many users feel they spend a lot of time repairing and dealing with problems with this sprayer. While some Solo users feel that these sprayers are reliable (55%), consistent (60%), and easy and simple to use (85%), others feel they are very uncomfortable (39%) and compromised on quality (44%). The top 3 weakest components cited by reviewers are stock harnesses, hand wands and nozzles, and lid gasket seals. Harnesses are uncomfortable, not very durable, and hooks can come unhooked when putting the sprayer on your back. Some reviewers complain of poor stock hand wand design and poor stock nozzles requiring replacement or upgrades. Various leaks and breakages were cited including a leak and break at the bottom of the tank, and leaks from the lid, pump, tips, trigger shut off valve, and handle (when jostled). Common part failures include: Cotter key that holds handle on, lid gaskets, trigger locks (not replaceable), and diaphragm pump gasket. One reviewer told of an infrequent (3 times in 20 years), but serious failure of hose-tank connections, resulting in serious leaks. Several others cited hoses and hose connections as issues with these sprayers. Other problems cited include: pressure regulation and reliability, unbalanced tank stand support making the tank prone to tipping during fill up and when putting sprayer on and off, splashing issues with the tank filter and screen cup during fill-up, pump handle location and operation, and difficulty completely emptying the tank. Some feel Solo sprayers are difficult to clean. Easy access to replacement parts was cited as a benefit to using Solo sprayers, yet some reviewers feel that replacing worn internal parts is difficult. Fans of Solo backpack sprayers described them as “workhorses” and “extremely reliable”. Although reviews vary when it comes to comfort and durability, easy access to parts, local suppliers, and ease of use are consistent benefits. One reviewer recommended piston pumps for infrequent (private) use because they tend to only last for a season or two of heavy (commercial) use. Diaphragm pumps are more appropriate for commercial users. Another reviewers reminds all backpack sprayer operators to perform regular safety checks, as seals do wear and drip over time. How often during the spray season do you thoroughly rinse your sprayer with clean water and/or tank cleaner? Daily cleaning of backpack sprayers is recommended by most commercial or county operations, with a minimum cleaning schedule of once per week. Always rinse and clean the sprayer when switching herbicide solutions in the tank to minimize damage to non-target plants. Do you winterize your sprayer before winter storage (in climates that freeze)? If your sprayer won’t be subjected to freezing temperatures, there’s probably no reason to winterize. But of those readers who do store their sprayers in freezing temperatures for the winter, 18% say that they DO NOT winterize. To the other 82%, good for you! If you haven’t read the TechLine article, Cleaning and Winterizing Herbicide Sprayers, (September 2011) it gives step-by-step instructions for winterizing your sprayer. Winterizing your herbicide application equipment is important to ensure safe storage over the winter. Spending a little extra time in the fall will save you time and money next spray season.